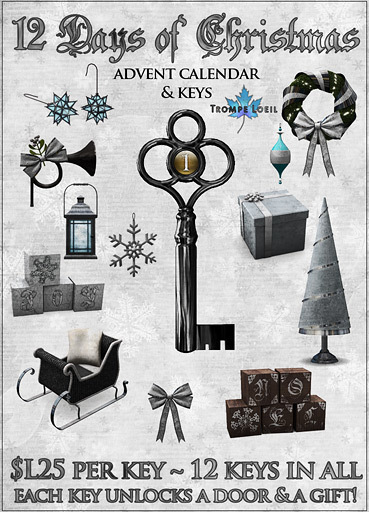 The Arcade opens for its December round on Saturday, and Trompe Loeil is so excited to offer an interactive Advent Calendar with collectible Keys that open the doors to give beautiful holiday decor prizes! 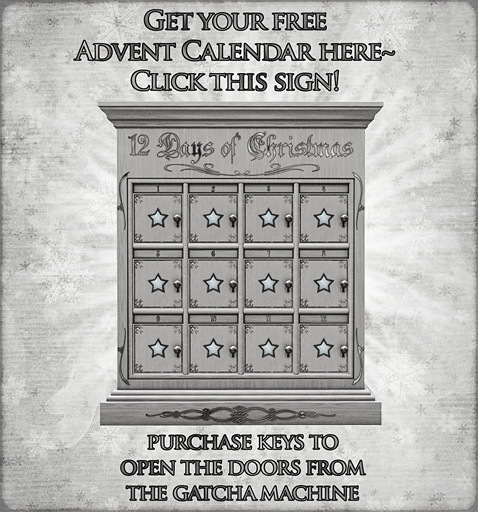 Click the sandwich board in front of the Gatcha machine to get your FREE Advent Calendar. You can stop at this step if you like, but the doors are all locked, and who knows what items are inside? If you’d like to get your hands on them, pay the Gatcha machine $L25 and get one of twelve Keys! Just rez your Key by your Advent Calendar and watch the corresponding door swing open, the star light up, and click “Accept” to get a full-sized version of the gift inside the door! (This is important – if you Decline the gift offer, you will not get another chance to get that gift unless you get a new Advent Calendar and a new copy of that Key to use! Make sure you click Accept!) You can now open and close the unlocked door and either discard the Key or keep it out as a decoration item. Once a Key has been used to unlock a door, it cannot be used again – the name of the Key will change to reflect its used status and the description line will show who it was used by, and when. This doesn’t mean you can’t trade Keys, though! If you have extra Keys you want to trade, just make sure they remain unrezzed and in your Inventory. If you’ve already used Key #7 (for example) and you rez another Key #7 next to an Advent Calendar with Door #7 already open, your second Key #7 will NOT switch to “used” status – you can pick it back up and trade it, or use it on a new Advent Calendar if you want another copy of the gift inside that door. Traders – please check the name of the Key you are trading for! If it says “USED” in the name of the Key, it will not work on your Advent Calendar! Keys check for ownership of any Advent Calendars in the immediate area where they’re rezzed – so you and a friend can both have Advent Calendars side-by-side and unlock only the doors on your own Calendars. If you’ve already opened Door #7 on your Calendar, but your friend’s Calendar has a locked Door #7, you will NOT unlock their Door #7 by rezzing a Key #7 – you would have to give them that Key and they would have to rez the Key themselves to unlock their Door. We really hope you enjoy this new take on the traditional Gatcha machine sale, and wish you and yours a very happy, safe, and wonderful holiday season!